Aussie Resort features 59 modern and spacious apartments, all fully equipped with kitchen as well as laundry facilities, air-conditioning and free cable channels. The hot tub and the heated outdoor pool in the shape of Australia is one of the many features that Aussie Resort offers. The balconies offer a panoramic view over the tropical gardens and swimming pool. After a busy day of activities, guests can enjoy in the outdoor meal in one of the 2 barbeque areas or finish the busy day with a game in the games room. 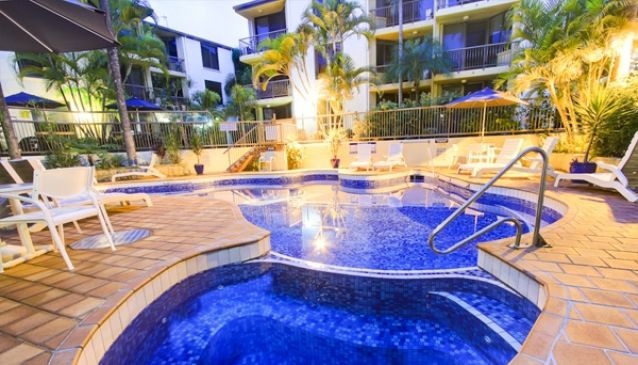 Situated in a perfect location, Aussie Resort is only 10 minutes' walk from shops, restaurants and clubs. The friendly staff will help its guests with making travel arrangements and fulfil their wishes. Aussie Resort is without doubt a perfect location for a relaxing and peaceful vacation.